If you’re looking for running costumes ideas that you can actually run in, you’ve come to the right place. Luckily, we have plenty ideas for costumes for running. Consider this your very own running costume guide. You’ve read the book. You’ve adopted an elf, and hidden it every single night. But the “Elf on the Shelf’s” magic isn’t limited to telling Santa all about the day’s adventures… we have it on pretty good authority that the “Elf on Shelf” loves to run races too! * optional: red running shoes and silver shwings , while they aren’t necessary, the extra details can be the “icing on the cake.” & We’re pretty sure that the shwings are the secret to the “Elf on the Shelf’s” magic. 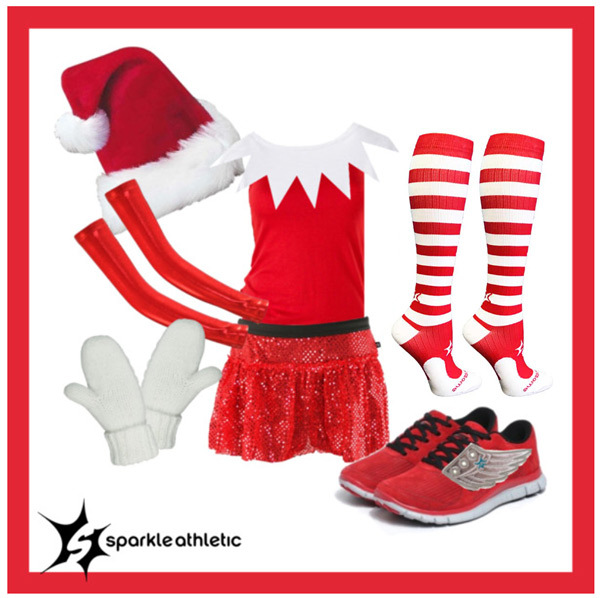 Assembling your elf on the shelf running costume is pretty self-explanatory. If you’re worried about it being too cold, swap the tank top for a long-sleeved shirt, and add some red running capris or tights!